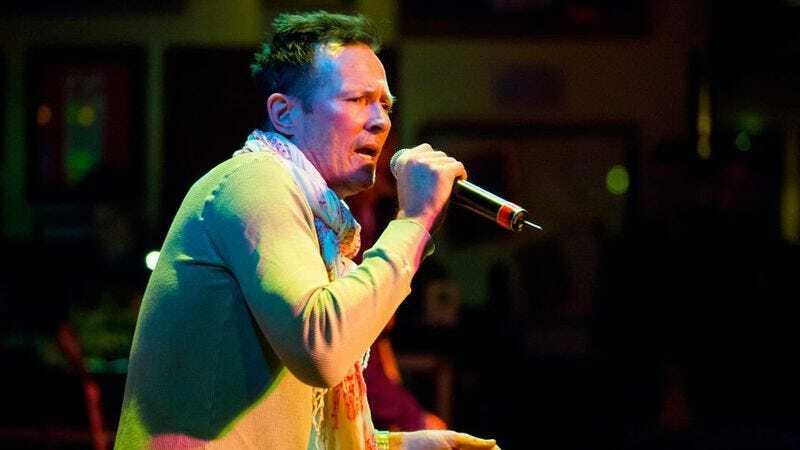 Former Stone Temple Pilots and Velvet Revolver frontman Scott Weiland died on December 3, and some of his old bandmates released a statement in the days that followed in which they paid tribute to the man and commented on how much they’d miss him. Now, Mary Forsberg, his ex-wife and the mother of his children, has written an essay for Rolling Stone that takes a different tone. Instead of a salute to Weiland’s life, it’s a plea for Weiland’s fans to not glamorize his death, and it’s predictably brutal hearing about how his struggles with addiction impacted his family. She opens the essay by explaining that the rest of the world will use December 3 as the day to mourn Scott Weiland, noting it as “the last day he could be propped up in front of a microphone for the financial benefit or enjoyment of others,” but she says Weiland’s children “lost their father years ago,” and “what they truly lost on December 3 was hope.” She also references situations in which she would try to shield the kids from their father’s addiction or temporarily clean him up in order to give them “a feeling of normalcy with their dad.” Eventually, though, Weiland drifted away from his family, remarried, and had even less of a relationship with his children. Fosberg says she isn’t doing this “to cast judgment,” but “because you most likely know at least one child in the same shoes” as Weiland’s and should be aware of what they’re going through. Noah and Lucy never sought perfection from their dad. They just kept hoping for a little effort. If you’re a parent not giving your best effort, all anyone asks is that you try just a little harder and don’t give up. Progress, not perfection, is what your children are praying for. Our hope for Scott has died, but there is still hope for others. Let’s choose to make this the first time we don’t glorify this tragedy with talk of rock and roll and the demons that, by the way, don’t have to come with it. Skip the depressing T-shirt with 1967-2015 on it – use the money to take a kid to a ball game or out for ice cream.